Constipation is a very common condition that affects people of all ages. 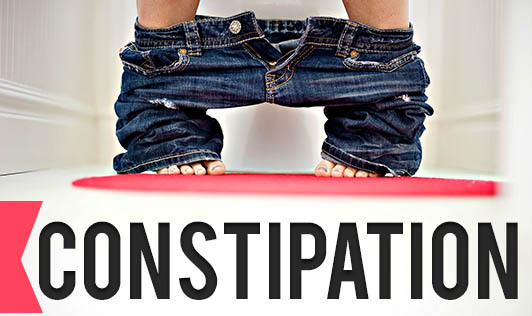 Constipation is defined as having a bowel movement fewer than three times per week. With constipation, stools are usually hard, dry, small in size, and difficult to eliminate. Older people are more likely to have constipation, usually because of dietary factors, lack of physical activity, use of medications and poor bowel habits. Causes: Vary from person to person and can be due to inadequate water intake, inadequate fiber in the diet, disruption of regular diet or routine; traveling, inadequate activity or exercise, stress, resisting the urge to defecate, certain medications, depression, eating disorders, irritable bowel syndrome, pregnancy or other conditions. Symptoms: Usually show up as infrequent bowel movements, loss of appetite, feeling of incomplete evacuation after having a bowel movement, swollen abdomen or abdominal pain. Diagnosis: Your doctor is the best person to diagnose and treat this problem. Make sure you inform him/ her of your medical history, record of eating habits, medication, and level of physical activity. Drink plenty of liquids: Gradually increase your water intake to 2 liters per day until your stools become softer and easier to pass. Eat a high-fiber diet: A diet with 25 to 35 grams of fiber each day will help your body form soft, bulky stool. High-fiber foods include whole grains, legumes, dry fruits, fresh fruits and vegetables. Limit foods that have little or no fiber, such as meats and processed foods. A dietitian can help to plan an appropriate diet for you. Exercise regularly: Get at least 30 minutes of exercise by going for a daily walk, run, swim etc. Physical activity will help to stimulate the intestinal activity. Heed nature's call: Don't ignore the urge to have a bowel movement. You can also try alternative approaches like massage, yoga or homeopathic remedies which may provide relief.